The one thing I love about learning about other cultures is that what you do in yours that's good, is not acceptable at all in another culture. And what's bad in yours is just fine in their culture. I just finished having lunch with His Royal Majesty, King Adamtey I, who heads the Se kingdom of Ghana, which encompasses 2 million people worldwide (In fact, he is the host of the African Technology Conference I'm attending and was the one who personally extended an invitation to me to give a keynote address). Over lunch, we were discussing what is acceptable in Ghanaian culture and the issue of language came up. His Royal Majesty, along with his brother and royal aides, got a good laugh out of Americans who curse, such as saying s–t, f–k, and other words we can't say on television and radio. He said that it's looked upon as no big deal in Ghana. And in fact, he said it's not a shock to hear a pastor say "this is f-–g wonderful" in church. I turned to my wife and said, "I would love this country!" because she knows I have an affinity to let loose and cuss like a sailor. But we also got a good laugh about hand gestures. In Ghanaian culture, if you give someone the thumbs up or extend your thumb to them, you are insulting them in a major way. If you point your open hand at someone, then that is considered a major offense. I was also told that anyone – especially a respected figure – who passes gas in public and is heard by someone else, completely loses any and all respect, whether it's the president or prime minister. And then the people will have no respect for them. It was a fascinating discussion because it was important to learn what is a no-brainer in one nation is seriously frowned in another. His Royal Majesty has promised to sit down with me on Saturday for a discussion that I'll shoot video of, and as a part of that, we'll discuss customs in Ghana. It promises to be entertaining. By the way, tomorrow is Friday and all across the country that is considered "traditional dress" day. I had planned on wearing a suit when I give my keynote, but I'll be dressed in African garb, which is cool, considering I've got like 20 outfits (although I only brought two since I planned to purchase others here). I'll try to broadcast my speech live on uStream.tv. I'll be out and about tomorrow and this weekend, so look for more pictures and video. Especially on Friday, when I'll be a part of a ceremony officially declaring me a "son" of the Se tribe. It promises to be a blast! You've been misled by a crook masquerading as a "king." There is no such kingdom in Ghana called "Se." 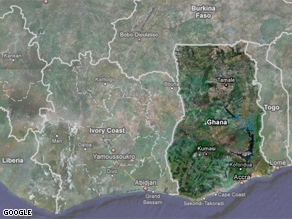 In fact, Ghana has no kingdoms. Likewise, the crux of your message is a misrepresentation of Ghanaian culture. It is NOT f****g fine in Ghana..
Hope you enjoy trip, but please double-check your facts, though. I got a good chuckle at that. BTW, you don't have to go abroad to experience "cultural friction." I get it just about every day here in the Big Apple. Ah yes – dignity, propriety etc. etc. !!! I sure hope you get more of these jewels to share with us Roland – these are very entertaining. I love the part about passing gas – one of my brothers has a "problem" with this and we have often threatened to hook him up and let him produce alternative energy for us – he could probably power a whole state. On the hand signals did they tell you what they meant or just that they were insults? I visited my sister in Cote d'Ivoire several years ago and remember getting a crash course in language and etiquette. Inquire about the health of family members. Don't extend your left hand to shake. Eat whatever you're offered. Ask before taking pictures. It was a humbling, intimidating, and absolutely amazing experience. Enjoy the rest of your trip. I look forward to seeing more about it. You have to get it right Roland! I am a Ghanaian, and I will tell you that there is no "Se kingdom" anywhere in Ghana; no such "His Royal Majesty King Adamtey I" ever lived anywhere in Ghana or Africa, for that matter. I could have been more uncharitable in my comments. Roland: It is always interesting to learn what is and is not acceptable in other cultures. But I have to admit I had no clue about the farting in public. Does this me burping is unacceptable too? Afterall, that is considered passing gas too, isn't it? Good luck with your visit and the festivities. Sounds like you are enjoying it! The irony with the use of the curse words s-t and f-k is learned from the watching Hollywood movies. That's how I have been introduced to them (my native language is Dutch). My fellow mates learned these terms after watching the movie "Scarface" and any movie with Charlies Bronson. But unlike American TV, no other country is really paying close attention to censorship. May have to do with "Thou shall not Curse." I actually had to dis-learn these curse words by deforming them into "s-hoo-t" and "f-udge". When I was a People to People High School Ambassador we had a briefing by the State Department about what body language & gestures meant in the different countries we would be visiting. It was very interesting - a lot of what is acceptable here is considered insulting in other places, but not in all of the countries. Roland. I don't know if you are into it or not but do you plan on doing any genealogy research while there? Hope to catch you in your African garb tomorrow. Take some pics and put them on here. We'd LOVE to see that! Good luck with your speech.